Furniture is something that you cannot do without. There has to be few of them at least in your home and any other places you go. So, one thing is pretty clear about the market of furniture is that there is a constant demand for it, what we have to see is the variation in the demand and the market perspective about this furniture market. If you are an entrepreneur looking for curving out your future and career in the furniture market, then probably this is a good time to put your money and brain in it as the market is showing signs of growth. In the past, people used to made furniture of various materials but wood, iron are the two of the most popular materials out of the list and they are not going out of the fashion. The best part of this business is it is not only commercial but there is a mixture of art and commerce. Furniture traces its way back in the history where people even used to carve out pieces of furniture out of stones, which are still there in the market but in limited proportion and expensive as well, then bones of animals were used as well. And now you can order your furniture online like on Urban Ladder which offers different types of furniture and decors, furnishings on their online portal at a reasonable price and it is easy to choose from the vast range and order which suits you the best. There is mainly or if you categorize broadly, then there are three parts of these market namely decor, furnishing, and furniture. Since the furniture is the most expensive part of these three, there is a slight shift in the demand of furniture to the demand of decors as they are readily available for use and comes within moderate amount. The furnishing segment covers almost 1/4th of the market and this is comprised of bed linen, linen for the kitchen, blankets, towels and similar products which are used in the daily life and also used for making your home look good. The furniture market is again divided into small and big furniture and the division is like 3:1 ration. This includes all the things you can conclude under furniture like sofa set, beds, tables for dining or study, almirah or wardrobe etc. Then the market is also divided along the use of the material in the furniture like whether it is wooden furniture market or metal or iron furniture market. There are even other materials which are used in making furniture like leather, plastic, thermo-sets and even glasses. But when you are thinking in an investment perspective, try to segregate the market first according to the application that is whether the furniture will be used in residence or in commercial purposes and then according to the regional market – North or South, east or west India. 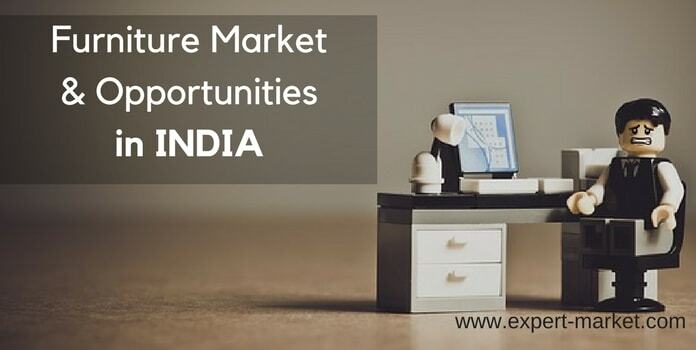 The segmentation within the market is really important as you need to understand which division of the market you want to deal in or you want to start production of which kind of furniture and which region of India you need to hit. Research on furniture market has shown a positive growth in the upcoming years. Few institutes have come up with the notion that it can grow and exceed UD$32 billion in the next financial year 2018-19. Other reports on the market also show that it is about to grow by approx 12.93% in the coming 5 years time. This is obviously pointing out on the profit margin that you can make out of the market by investing in it now. Though the residential sector is slacking in its growth for last one or two years in a row but overall if you see the growth is positive across the country and thus the market is expected to grow accordingly for furniture as well. The growth is inevitable as analyzed by the top research firms in India and we also see the CAGR is about to grow by almost 13%. Now the question we need to dig into is what are the components or drivers for this positive growth. This is important as we need to understand and invest our money accordingly. So the growth in this market is stimulated by the urbanization of the important cities and town like in Maharastra, Gujrat or in the south, there is Tamil Nadu which is developing at a rapid pace. Both residential and commercial developments are affecting these places and thus the furniture market is also expected to grow in these regions. The next is, of course, the increasing demand for the compact or integrated modular homes which demands new and modern furniture so that the optimum space utilization can be achieved even if space is small. This idea if you can use can get you good business as in this competitive world, space is getting smaller which you get to build or buy your home, thus to make your home look bigger and use it properly, you would need compact furniture. The growth of nuclear families is another factor influencing the furniture market as well as the real estate market in India. We also try to imitate the western culture and thus out furniture market is also getting affected by the same. The globalization has also affected the market as people are moving to different cities at an early age and they need a home to stay and thus furniture is required as well. There are many challenges as well in this sector like most of the market is unorganized and thus they offer furniture at a really low rate which attracts most of the buyers but in reality, the quality is not up to the mark. And the quality furniture which is sold by the major players comes at higher range which most of the people cannot afford. Either government or a profound association needs to be established to sort out this market demand and supply problem so that the market can be regulated and directed to make maximum profit.